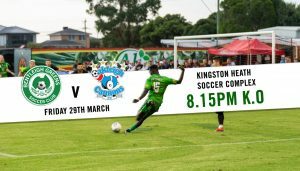 The Greens will be aiming to keep their strong home form going when they take on Oakleigh Cannons at Kingston Heath Soccer Complex on Friday night. In an intensive game last Saturday night, Bentleigh shared the points with Dandenong Thunder after a 2:2 draw. It was the second game in a row that the Greens did not manage to win away from home. The result saw them drop from second to third spot on the ladder, with Avondale FC on top and Melbourne Knights in second spot. Bentleigh’s home form however is immaculate this season so far. All three games at Kingston Heath have been won – 3:1 v South Melbourne, 3:1 v Green Gully and 2:0 v Hume City and only two goals have been conceded so far. Oakleigh had a terrible start to the NPL season, getting just one single point out of their first five games (losses to Knights, Hume, Thunder and Magic, a draw against Kingston). Last weekend though, the Cannons enjoyed their first win of the season against Heidelberg United and they moved from last spot into 12th on the ladder. The Greens took all six points from last season’s encounters between the two teams. In round 2, Bentleigh recorded a narrow 1:0 win away from home through a late goal by Mitrovic. In the second game in round 15, the Greens took control from the start and came away with a convincing 3:0 win at Kingston Heath through goals by Webster, Hatzimouratis and Mitrovic. Joe Guest scored a goal each in Oakleigh’s last two league games against Heidelberg and Altona and will certainly be a player that the Greens need to be wary of. Bentleigh winger Valentino Yuel has been announced as a new signing for Western United, the A-League’s newest club, during the week. It came as no surprise, as Yuel has impressed onlookers this season with his pace and acceleration after joining the Greens. Before he joins Western United however, he will be a crucial part in the upcoming games for Bentleigh and he will aim to once again show everyone, why he deserves a contract in the A-League. The Greens will try to keep their home winning streak going. They are favourites on paper, but after their first win of the season, Oakleigh will try to keep the momentum going and take all three points from Kingston Heath.